Partly encompassing the coastal beauty of Hat Khao Lak is the Khao Lak-Lam Ru National Park. It was initially established as a terrestrial Park but in 1995 it was transferred to the Marine National Park division due to the inclusion of several marine resources. This 125 sq km National Park now offers a lovely collection of sea cliffs, hills, and beaches in addition to dome shaped granite mountains from the Cretaceous period and tropical evergreen forest. The particular geology of the whole region had an earlier economic impact, as tin was once extracted from one or two areas outside the park, although now there are no traces of this former economy. The Park runs in a West-East direction and geographically covers two parcels of comparable area, joined by a narrow band of jungle. 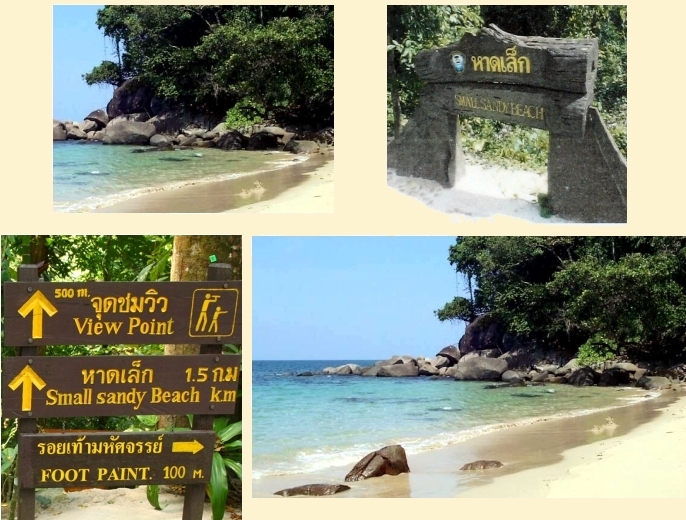 The coast around Hat Khao Lak thus only represents a small portion of the overall Park. 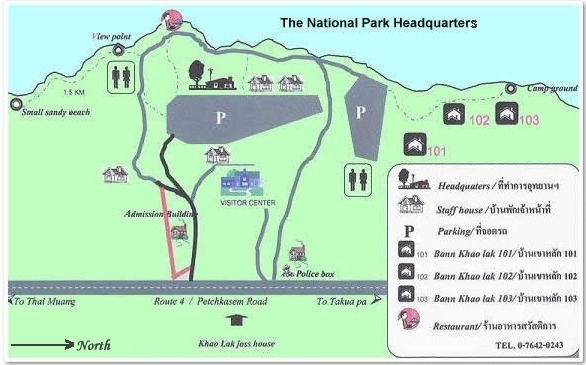 The headquarters of the park are located 50 meters off highway 4, on the picturesque headland of Leam Hin Chang. There is a relatively varied range of flora and fauna, considering the park's size. Most of the true tropical evergreen forest occurs on the forrested hills closer to Khao Lak. Here there is effectively a three level canopy overlooked by a few emergent forest giants. The forest has many climbers including Rattans, and is also rich in epiphytes such as orchids, and ferns (eg. the fern Drynaria bonii H. Christ ). Species of mammals include colugo (flying lemur), langurs, macaques, black drongos, Malayan porcupine, binturong (Asian bearcat), Malaysian weasel, Malaysian tapir, Sumatran serow, gold whiskered barbets, black giant squirrel, and various bats. Reptiles include the Bengal monitor, iridescent earth snake, Malayan pit viper, white-lipped pit viper and reticulated python. And amphibians include bufo asper Gravenhorst (Asian giant toad), rana laticeps Boulenger ( corrugated/rivulet/southern big headed frog) and Heymon's froglet. Birds such as the crested serpent eagle, white bellied sea eagle, emerald dove, scarlet minivet, bushy-crest hornbill, oriental pied hornbill and the homrai, can be found. The list of butterflies includes Troides aeacus thomsoni, Troides amphrysus ruficollis, and Stichophthalma godfreyi. These are mostly found in the primary rain forest. The marine areas of the Park have members of the sea cucumber group (eg. black cucumber, H. scabra), sea slugs, morey eel, lizardfish, Long Tom, giant murex, tiger cowrie, and feather star. The Park actually extends into four different Amphoe (districts) within Phang Nga Province - Amphoe Takua Pa, Amphoe Kapong, Amphoe Thai Muang and Amphoe Muang. There are several small mountains including Lak mountain, Lam Ru mountain, Mai Kaeo mountain, Prai Bang Toa mountain and Sang Tong mountain. The highest peak is about 1,050 meters. The Phang Nga and Takua Pa rivers originate from these ranges. The Park is ideal for hiking, forest walks and viewing wildlife. There are 5 kilometres and 7 kilometres Namtok Ton Chong Fa Nature Trails, taking about 2 and 5 hours, respectively. There are nature interpretation signs along the steep routes. A guide is needed. Chong Fah is the closest to Khao Lak. This waterfall is a single 10m drop with a pool at the base which is good for swimming. A forest trail leads up into the interior of the park from here. Buddhist monks once had a forest retreat nearby, and remains of their shelter are still visible. The waterfall is accessed initially via a tarmac road at Bang Niang; thereafter an offroad vehicle (or motorcycle or simply good footware) is required for the remaining rough jungle track. The waterfall is a further 10 minutes walk from the end of the track. The most popular waterfall is Lam Ru (Nam Tok Lam Ru), in the area of Kradai ridge, close to Kapong, which is about 30km from the Park HQ. This is a pretty five level fall, of medium height, and flows throughout the year. Several varieties of birds are close by. Approach the waterfall via Kapong on route 4090. Ton Pling which is close to km marker 55 on route 4 just south of the Park HQ. Hin Lad waterfall which is just a few kilometers after Lam Ru. Although not quite within the official park, there is also the Sang Tong waterfall, which lies west of Kapong off route 4090, and the Kapong hot springs and associated natural pool, at a temperature of 65C. 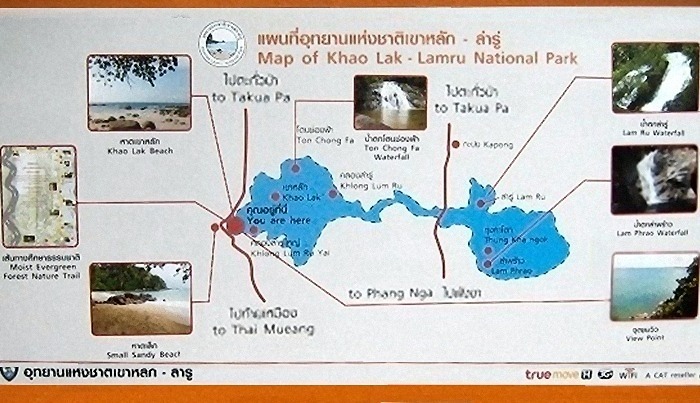 The National Park is named after two of its highest peaks - Lak and Lam Ru. The Park is the watershed of the province's major rivers including the Phang-nga and Takua Pa.
- hiking and forest walks. - viewing wildlife, fauna and flora, bird watching. - nature trail (3 km) along cape near Park HQ. At the park HQ there are four bungalows for accomodation. Camping is allowed although there is no truly designated area. There is a park HQ restaurant and one or two small private restaurants. Public toilets are available. Accomodation should be booked in advance - at the Reservations Office, National Park Division, Royal Forest Dept., Chatuchak, Bangkok. Tel: (02) 5780529, 5794842, 5795269.